Decca brings together two of its biggest stars for this “Emperor”, both seasoned Beethovenians. Nelson Freire and Riccardo Chailly don’t have quite the same take on this music, but their approaches prove to be complementary. Freire is lyrical and supple, always letting the line flow. Chailly offers more drama, drawing a focused tone from the orchestra, and always propelling the music in the faster sections. The Gewandhaus Orchestra also fits well into the equation. The strings provide the ideal support for Freire, matching the smoothness and intensity of his piano tone, just as intense but just as nimble too. The woodwind soloists are another of the orchestra’s great strengths, and although their solos are only ever short here, each comes through with character and individuality. The Adagio second movement is a particular treat. Freire’s tone sounds completely effortless, as if he is just breathing through the piano. Yet he has enough presence to carry across the orchestra without the players having to restrain from their elegantly shaped phrasing. If I’ve one complaint, it is a lack of muscularity from Freire. This, the most heroic of piano concertos, could sometimes do with more gravitas. The opening of the finale, for example, flows too smoothly out of the Adagio, and there is little feeling of turbulence or grandeur. 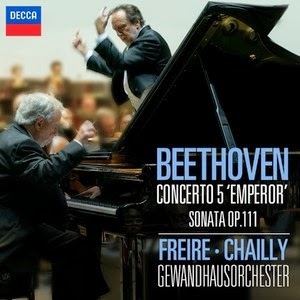 Freire compensates with yet more lyricism and elegance, and it is to the credit of both Chailly and his orchestra that they follow the soloist’s lead here; judging by their recent symphony cycle, they’d probably have done something more emphatic if they’d been working with a more heavy handed pianist. The concerto is coupled with the Piano Sonata op. 111, but at approaching 25 minutes it is more than just a filler. Freire gives another lyrical, flowing performance, making what in other hands can seem a complex and intellectual work into an exercise in grace and elegance. It’s seductive and beguiling, and the work’s complex structure is well served by the pianist’s narrative approach, leading the ear through the various sections and always offering logical connections from one to the next. The opening of the second movement is magical. Here, for a few minutes, time seems to stop, as Freire draws out the Adagio melody with little concern for pulse or tempo. Then, as Beethoven elaborates the theme into a series of variations, Freire gradually brings us back down to earth, imposing discipline and pace, but still maintaining the elegance of his tone and line. The documentation provided is slight, just a brief and severely edited interview with the pianist by James Jolly. Freire tells us he has been playing the “Emperor” since he was 12. That’s well over 50 years, and his intimate knowledge of the music is certainly demonstrated. He also reveals that this is to be the first release in a complete Beethoven concerto cycle. Apparently it is going to take a few years, the next release will be the Fourth Concerto, scheduled for 2016. On the strength of this first recording, it should be worth the wait.